In a large skillet over medium-high heat, melt butter with extra virgin olive oil. Add scallops. Make sure the scallops are in a single layer if possible. Cook for 2 to 3 minutes per side, turning once. Add wine, spices, dill and peppers. Stir gently. Cook for 3 to 4 more minutes and remove from heat. 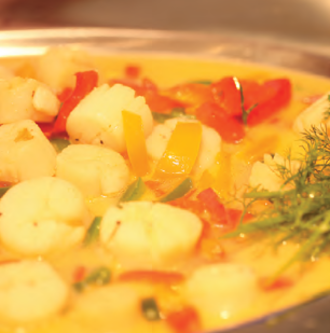 Pour the pepper scallops onto a serving dish and garnish with fresh dill sprigs. IMPORTANT: scallops retain a lot of water so as you cook this recipe, you will be steaming them, not grilling them. To grill scallops, you have to pat them dry before cooking them to remove the water. Same scallop, 2 different methods. Hint: this goes great over mashed new potatoes–the little red ones.